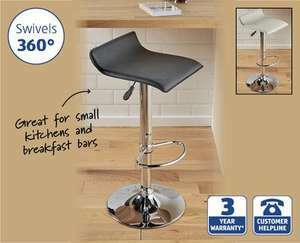 Get the modern look in your kitchen with this comfy, height adjustable stool. Same thing in Homebase with white painted seat £59-99. This is a brilliant deal, bought 2 this morning very easy to assemble 5 minutes, they even give you spare screws & washers, well designed & manufactured any problems with assembly there is a free phone number. Thanks OP, on shopping list anyway. bought 2 last night, one went up ok and the other will be getting swapped today, the bit where the 2 main bits screw together wouldnt fit. Surprisingly good build quality for the price, picked one up last night from Hilton store. Aldi does it again! Build quality is excellent - and 5 minutes assembly. Height adjusts so a 4 year old can just climb on,up to too high for an adult male! Did a double-take on this after reading it first as Padded Gas Lift Bra. Good spot, thanks...just picked up 3. I called Aldi customer service who advised what stores local to me had them in stock; they even reserved them for me even though they say they don't do reservations. Great service. Got some of these in cream,really good quality & nice looking!